Check out Jenny's blog for easy dessert recipes, baking tips, plus interesting ingredient & food facts. GOURMET COOKIE GIFT TIN – Each one of these tins are filled with 25 cookies of your favorite flavor choice. Made in a bakery using peanuts and tree nuts. Items that do not contain nuts may contain traces of these ingredients. 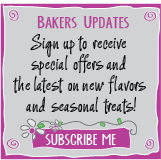 Click the button below to add the GOURMET COOKIE GIFT TIN to your wish list.